I’ve been sharing a storage disk between Windows and Ubuntu for the past while and randomly encounter the following issue sometimes when I boot up Ubuntu and try to mount my Windows storage drive. Error mounting /dev/sdb1 at /media/bladelores/01BC76G7Z2628FB0: Command-line `mount -t “ntfs” -o “uhelper=udisks2,nodev,nosuid,uid=1000,gid=1000,dmask=0077,fmask=0177″ “/dev/sdb1″ “/media/bladelores/01BC76G7Z2628FB0″‘ exited with non-zero exit status 14: The disk contains an unclean file system (0, 0). This is caused by Windows 8 new ‘fast start-up’ feature. 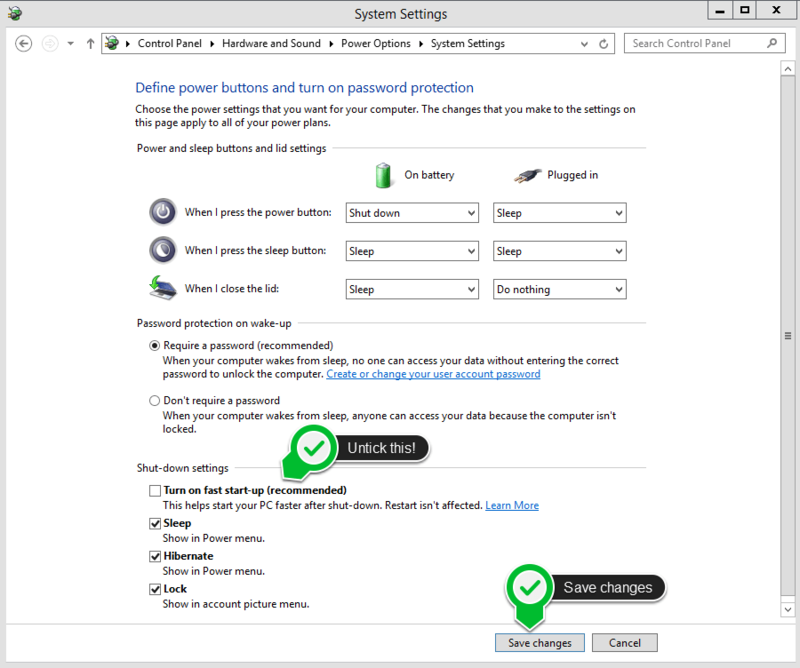 In Windows launch Control Panel and search for “Power”. Click on “Change what the power buttons do”. Next click the “Change settings that are currently unavailable” action near the top of the power settings screen. Now you can restart Windows and you shouldn’t encounter the mounting issue in Ubuntu again.